Dorianne and I are in Sitges, Spain this week, which is a beach town south of Barcelona. 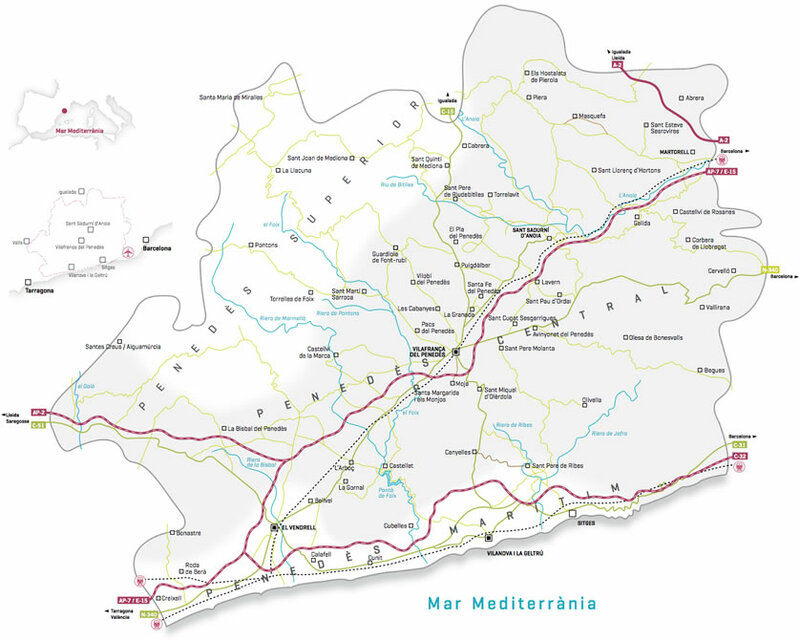 Just east and slightly inland from Barcelona is the Penedès DO Wine Region, home to a variety of wines, including Cavas, the sparkling wines of Spain. More about cavas in later posts. 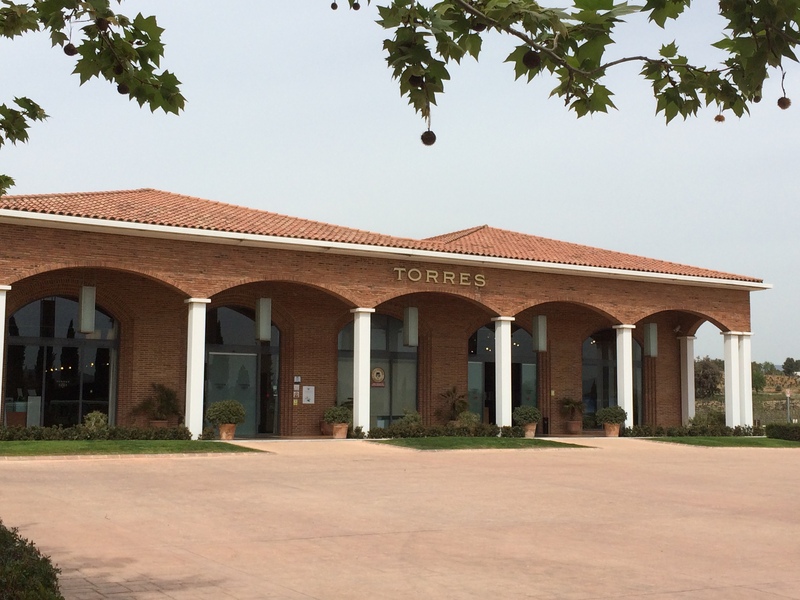 This concerns our visit to Bodegas Torres (LINK), in Villafranca del Penedès, one of the largest wine makers in Spain. 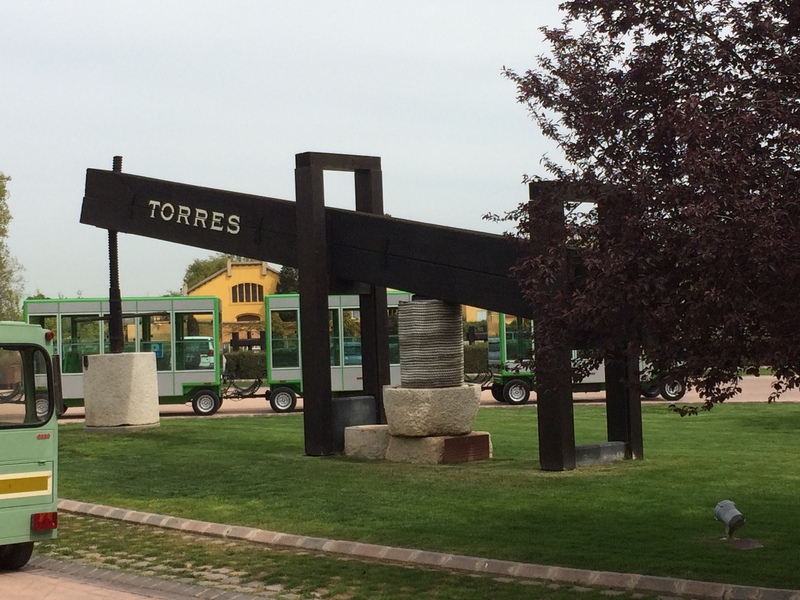 Bodegas Torres is truly a huge operation with a storied history and wine production all over the world (LINK). 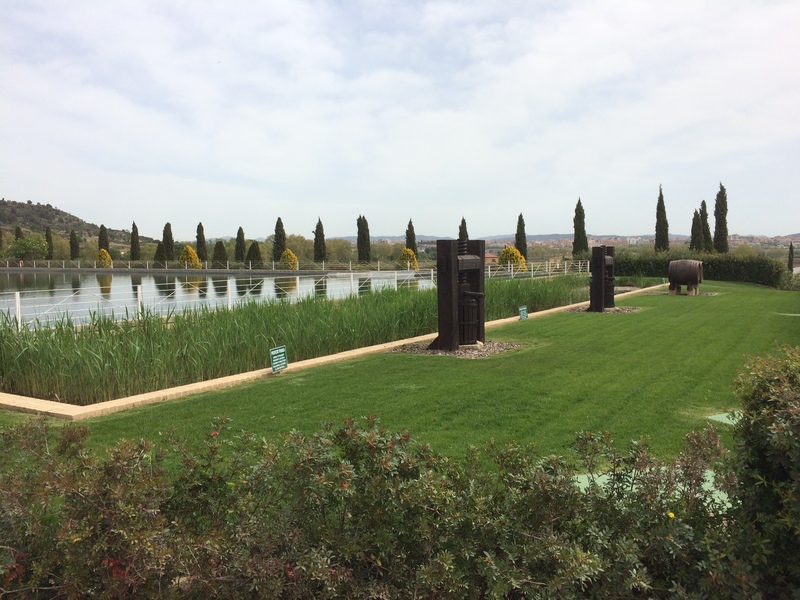 The Penedès Winery is a state of the art facility producing wine and brandy and is located next to the family home. 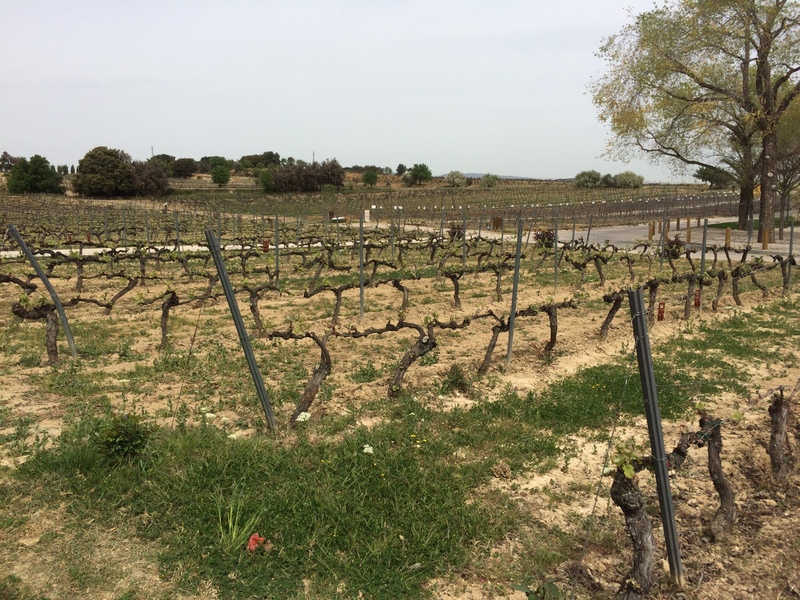 It is roughly on the level of a Mondavi or a Gallo-sized operation, to give you an idea. 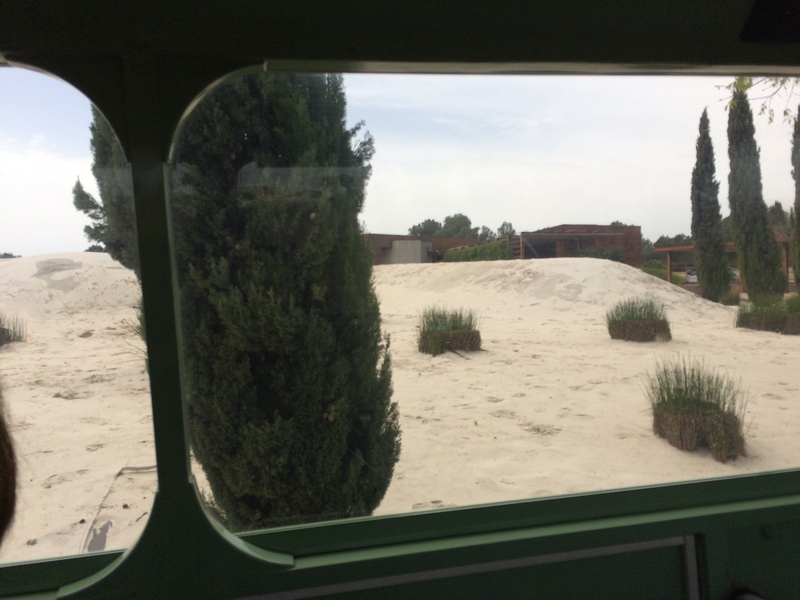 The wine tour (which we were given alone with a guide, Archie, a young man from England) includes a tram and Universal Theme Park-like effects, which were inspired, we learned, by a family visit to Universal Studios in Los Angeles. So this is not your boutique winery. That being said, the company is taking strong steps at environmental sustainability (LINK), including recycling, energy and land conservation, increased organic and biodynamic farming practices, and the like. 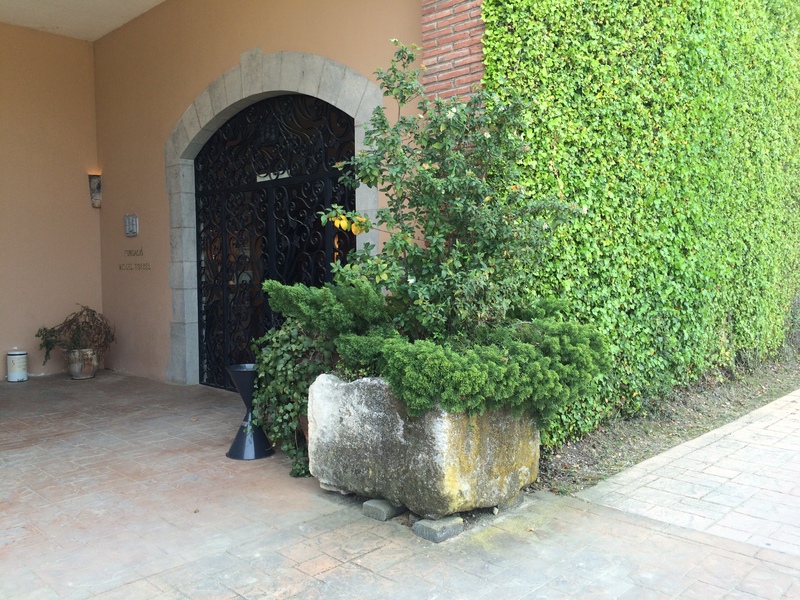 The tour highlights many of these practices, which the company obviously sees as a good way to market their wines. I agree with them. Reservoir used to clean equipment – water is recycled through the artificial wetlands. 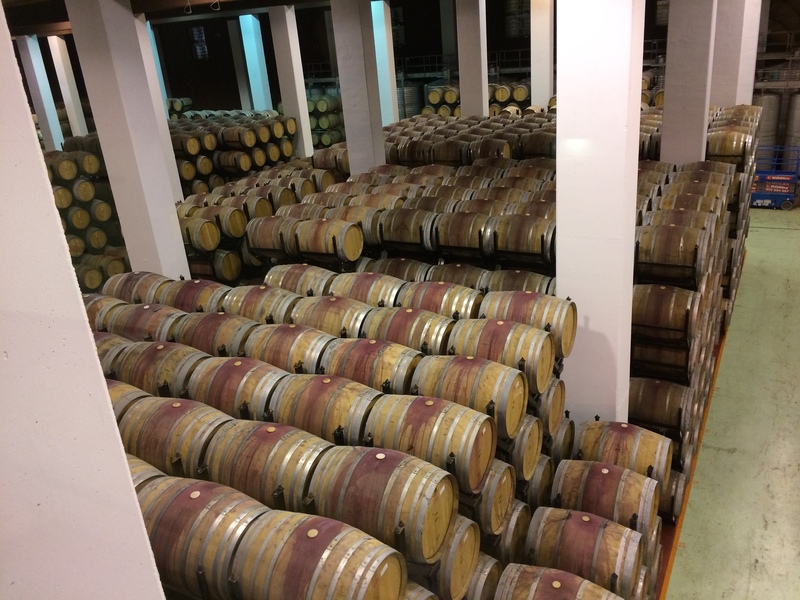 The winery facility in Penedès processes millions of bottles of wine annually. 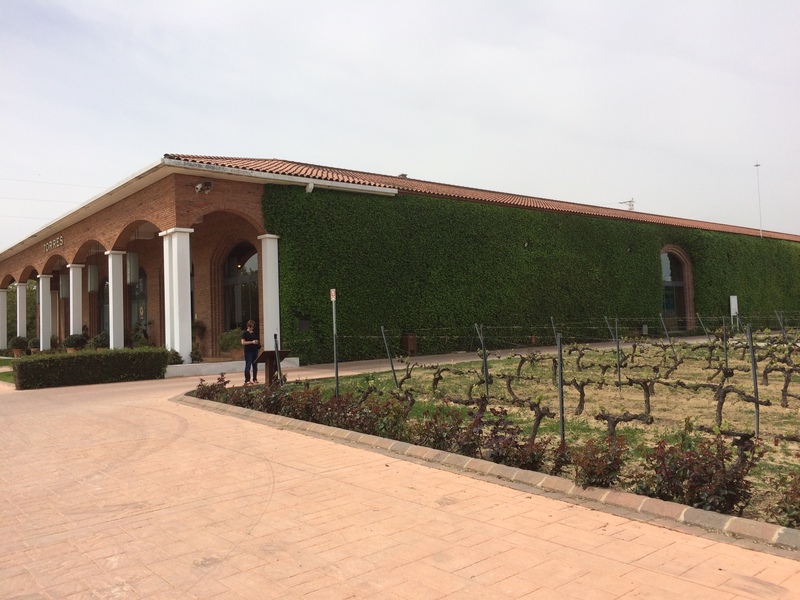 It has the look and feel of a place that has the resources to create whatever the owners want – the buildings are nicely appointed, the vineyards well tended, the equipment is in excellent condition, plus there are very nice touches for the customer at every turn. 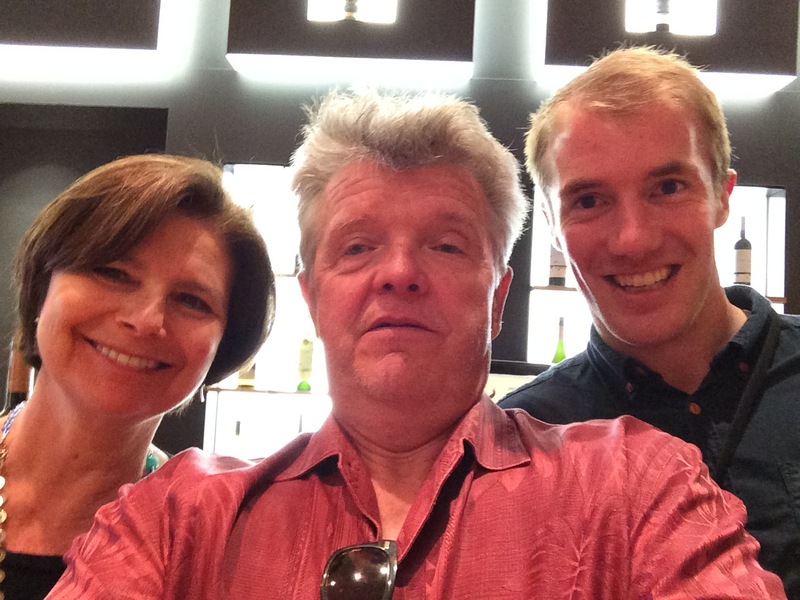 There are about a dozen wines and several brandies produced here. Our tasting after the tour was limited to five wines from three regions in Spain. 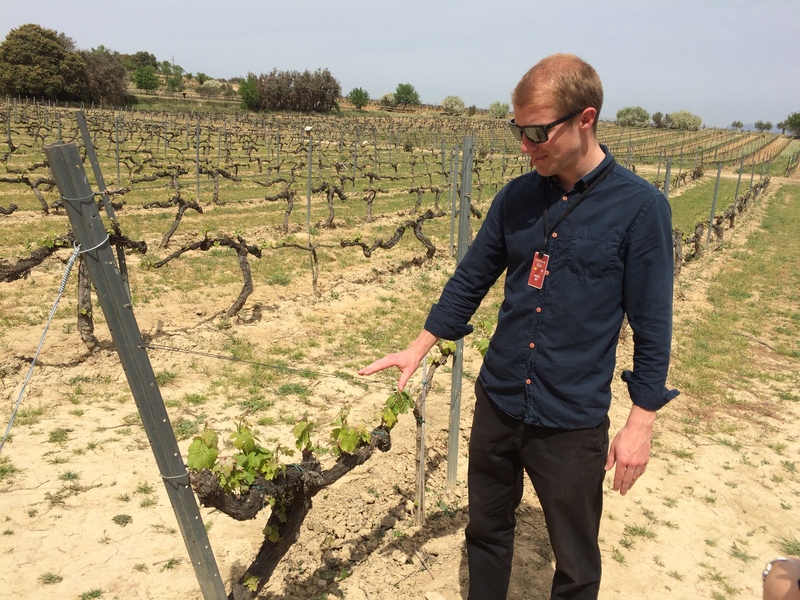 Archie our guide, has been with the company for about a year and is working toward wine certifications in England. His plan is to work in the wine industry. He showed a great deal of knowledge about the entire process, and he was able to answer most of our questions. 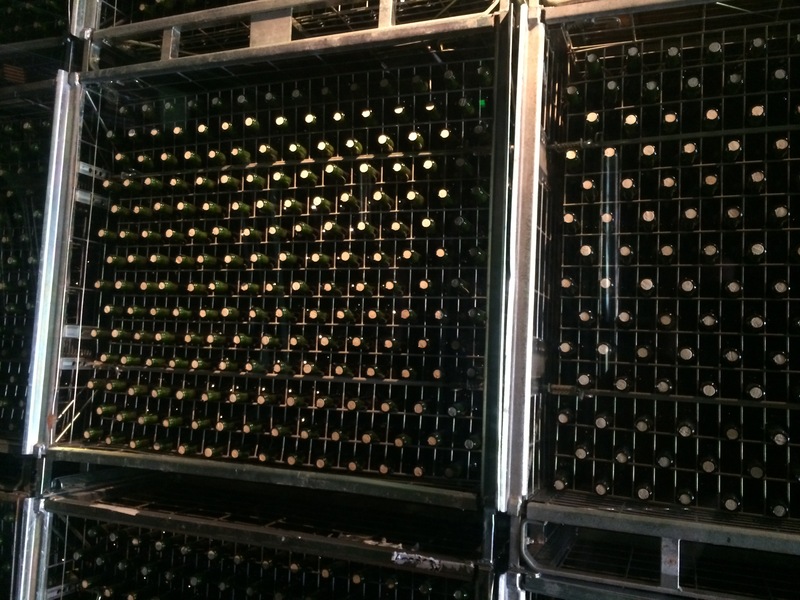 The tour would be an excellent introduction for someone new to wine production, and we learned a thing or two as well. Our guide, Archie, describing pruning techniques. As to the tasting – the wines we tried – two whites (blancos) and four reds (tintos), were all well-crafted and balanced wines. We tasted across several of the labels of the winery – (there are dozens). 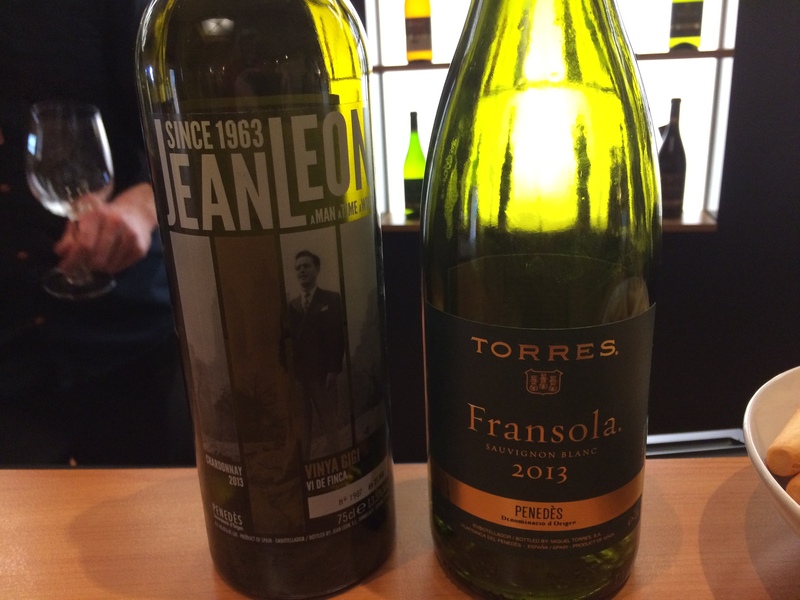 The blancos, were a 2013 Jean Leon Chardonnay from Penedès DO, and a 2013 Torres Fransola Sauvignon Blanc. The Chardonnay was 50% oak barrel aged and 50% stainless steel. It was similar to the increasingly popular style of Chardonnay from California, which is less buttery and powerful. The wine was refined and nice on the nose and in the mouth. Very good. The Sauvignon Blanc was more in the French style – smooth and elegant. The wine did not jump out at you with citrus or grassy notes like New Zealand Sauvignon Blancs; rather it seduced you a bit – this wine would be amazing with shellfish, we both agreed. 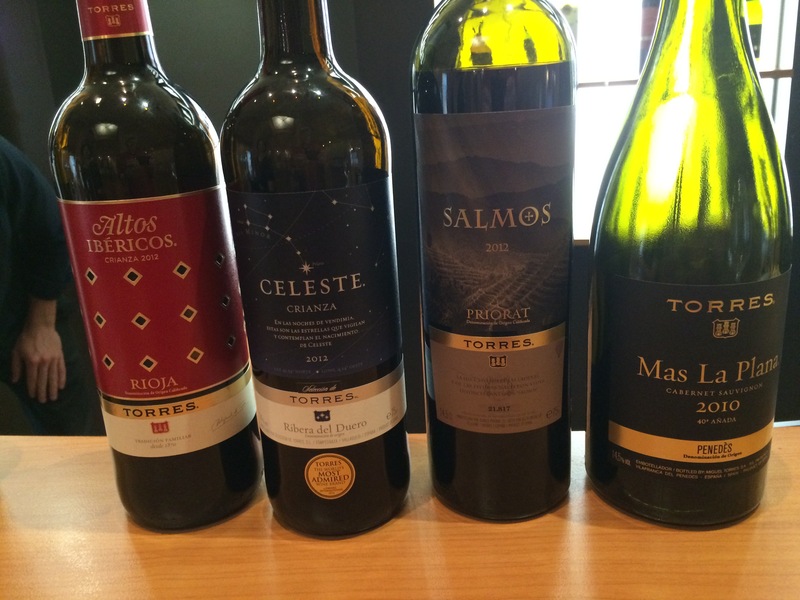 The four tintos were also all well-structured and balanced wines. 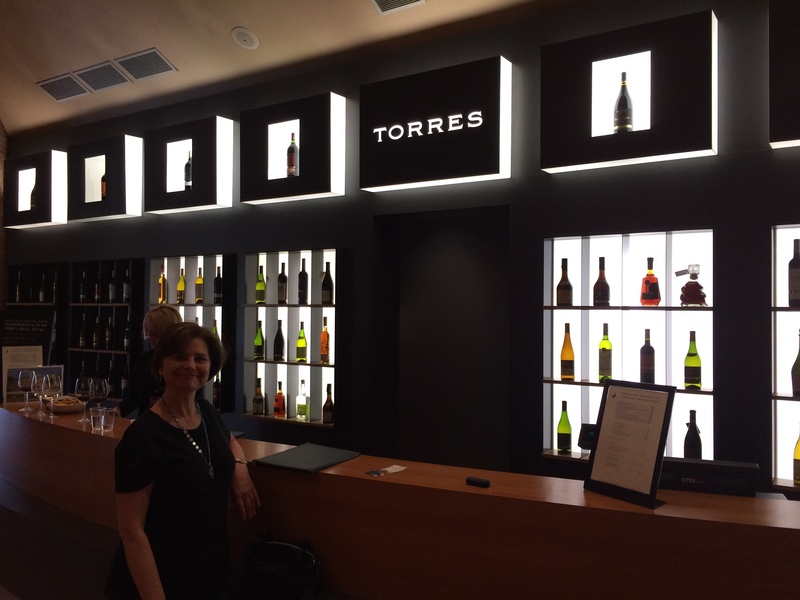 They included a 2012 Torres Altos Ibericos Crianza Rioja, a Tempranillo with good character. Moderate tanins and acid make this wine good for drinking alone or with food, such as barbecue or some wonderful Iberico Jamon. The second tinto, a 2012 Torres Celeste Crianza from Ribera del Duero DO, a Tinto Fino (the name for Tempranillo in that region). This wine was more fruity and had lower tanin – but was clearly well-crafted. Very nice. Next, we moved on to the two higher-end wines in the tasting. A 2012 Torres Salmos a blend of Cariñena (60%) Garnacha Tinta (20%) and Syrah (20%) grapes from the Priorat DO. I have really enjoyed just about every Priorat wine that I have tasted, and this one was no different. A very dark, rich color, fruity and spicy on the nose, and bold fruit-forward in the mouth, very thick (but not unpleasantly so) mouthfeel and a long, silky finish. I really love this wine. 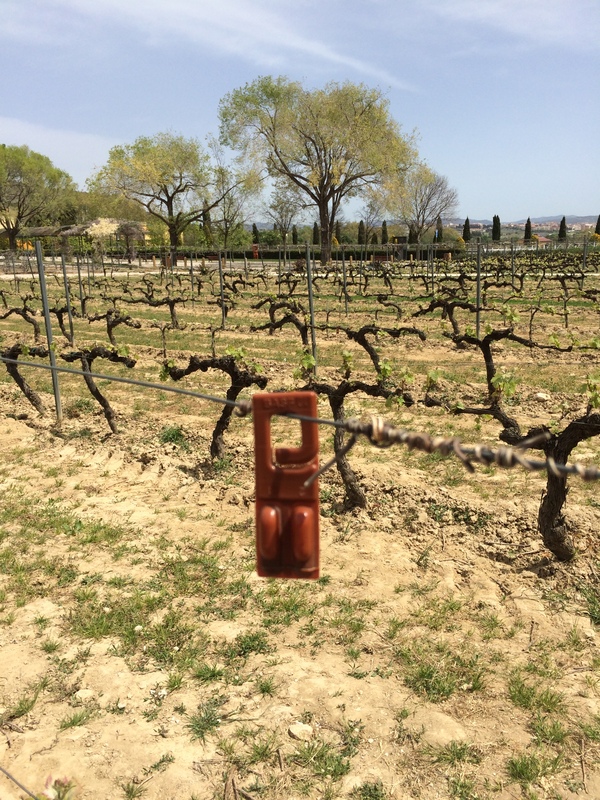 Finally, we go to the 2010 Mas la Plana Cabernet Sauvignon from the Penedès DO. This wine brings a greater complexity with some mushroom on the nose and hints of minerality just behind the fruit. Good tanins and acidity balance on the tongue and the finish is smooth and elegant. I liked this just a tiny bit less than the Salmos. The latter two wines should age beautifully. You can research more details at the Torres links above. 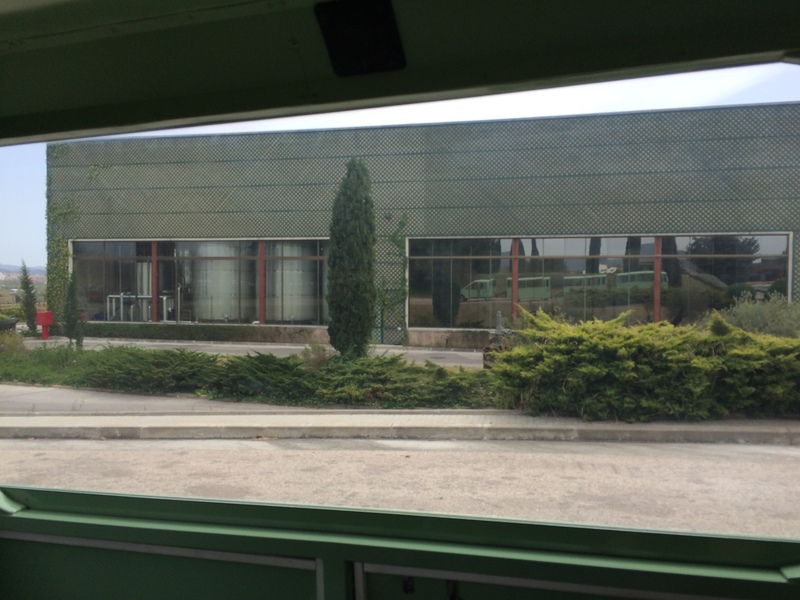 This may not be the winery visit and tour for everyone – it is a very large facility and run like one. But it does give good insights into the Spanish Wine Industry. There are a number of smaller wineries in the region as well. Dorianne, Jim and Archie after the tasting.